With the responsibilities of direct parenthood nearing their end in Karin’s case and with me in the midst of my sixth decade, it was important for us both to continue to make the most of life before decrepitude finally arrived. I had had an eventful motorcycle trip up to Tanzania in 2014 which led to the acquisition and outfitting of a 4 wheel drive vehicle for a seven month overland journey to Ethiopia and back with Karin in 2015. After that great experience the question naturally arose – what next? Whilst visiting my daughter Megs, just before Christmas in 2015, she told me of a Mexican family she had met in Hout Bay. Those folks had bought a catamaran and sailed around the world, with the upcoming Atlantic crossing their last major passage before returning home. Out popped the question from Megs ‘Didn’t you once want to go sailing Dad?’ In a flash I recollected how I had researched this extensively about 15 years ago, before deciding then that the time wasn’t right. As kids, my brother Rick and I had played a small and usually reluctant part in helping my father to build a 24 foot Eventide sloop in Zimbabwe, which he and mum eventually sailed to Australia. Prior to that the family had spent several glorious years sailing her on the Mozambique coast. Despite her diminutive stature and complete lack of amenities Rebel provided the means for us to experience an amazing way of life and meet some wonderful people. The bug had bitten me. I was then in the midst of editing the DVD movie of our trip experience in support of a book titled ‘Destination Danakil’ which we had been persuaded to produce by friends, chronicling our recent travel experience to the hottest place on earth. 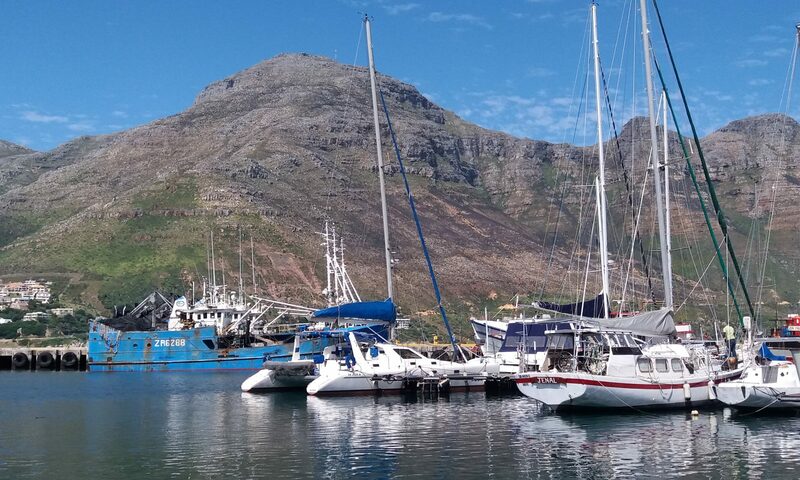 Nevertheless, sensing that I needed to get some momentum going on the sailing venture, I made reservations with a Hout Bay sailing school to get my skipper’s ticket, starting three months later, at the end of March. All the while Karin was totally involved with Tracks4Africa as their editor, producing travel guides, their weekly blog articles and maintaining their presence on social media. The intervening time flew by as I finished the film and got to grips with the intricacies of book layout, learning as usual, the long and hard way. Finally after preparing the single page pdf files, we proof read the printed draft, made the final corrections and were ready to move on….. There were several challenging aspects to the sail training; not the least of which was spending about a month in total on a small boat with mostly (very) young adults, where the difference in my 40 year plus age gap with them became apparent. They were mostly sponsored by parents apparently trying to prevent a ‘failure to launch’ in life, so these youngsters were more tolerant of the late starts, equipment failures, lack of gas for cooking, etc that characterised the way things ran. Not surprising, they also had an aversion to cleaning up and washing dishes. Challenging in a different way was the theory training, where the minimum pass mark was 80%. I had last written exams about 40 years previously and best described to friends the learning process now as being constrained by the age reduced portal permitting data assimilation by my brain. This, coupled with the obligatory exam at the end of each theory week, demanded a more effective learning method to which I was accustomed. For six weeks we alternated between practical and theory, with the grand finale being the sailing exam up at Langebaan. The day prior to this, as we were completing our final preparation, our trainer, Russell, dropped a bombshell for me. I had been explicit and done my best to ensure with the sailing school that they had enrolled me for a course which would enable me to skipper a yacht locally and then sail her out of South African waters. However, Russell pointed out that I had in fact been studying the curriculum for the British Royal Yachting Association examination, not recognised by South African Sailing. Frantic phone calls thankfully remedied that situation and I was able to do my practical the next day according to the South African requirements. There was one proviso however: I needed more sea miles than RYA required and would have to write another challenging final theory paper. Fortunately most of my cycling buddies were competent erstwhile sailors and some were still involved in the industry. So a few phone calls saw me fly up to Port Elizabeth a couple of days later and board one of the Vasco race yachts, Yes Girl, to assist in her passage home. Gabriel, the skipper and owner, was only too happy to have another crew member on board, in addition to young Marcel, and when I got there he mentioned in passing that we would be ‘hammered’ going around Cape Aghulas and Cape Point. That proved to be an understatement, with the wind peaking at around 55 knots and the yacht racing down the steepening swells as darkness fell. We moved all the weight we could to the stern of the boat to try to lighten the bow and, with some difficulty hoisted the storm jib. Despite this Yes Girl was knocked over so often that it was no longer remarkable. We just let her rise, hoping the rigging would stand up, and then forced her back on course against the huge pressure on the steering, which kept jumping on its chain linkage. Without adequate clothing Marcel had spent most of his time below, later recovering from a collision with the cabin table after been thrown off the bunk and smashing it off its pedestal. Gabriel had been on the wheel for five hours non-stop and at around 21:00. we swapped places for the cabin, where soaked through, I had retreated temporarily to warm up. It was bizarre to sail Yes Girl past Hout Bay, then Camps Bay and Sea Point in those conditions, seeing all the homes cosily lit up whilst we were in a maelstrom of weather exacerbated now by ferocious down draughts off Table Mountain. Finally, after six hours on the wheel, at 03:30 I handed over to Gabriel who took us into Table Bay and berthed Yes Girl at the Royal Cape Yacht Club. I had long since resolved not to spend the night amongst the sodden chaos in the cabin. Gabriel and Marcel slept in the yacht club lounge whilst I called an Uber. Half an hour later, still soaked with sea water under a plastic motor cycle suit which did duty as rudimentary heavy weather gear, I peeled off the sodden garments and got into a warm shower at home, marvelling that I could now be so warm and dry after the experience of the past 18 hours! Not only did I gain the sea miles that I needed on this short passage, but also realised that my youthful sailing experience had taught me not to fear the sea in this state, recalling how the tiny craft of my childhood experiences had always risen to what then had seemed to be impossibly high and steep waves. With a Coastal Skipper’s ticket in my wallet, it was now time to consider what boat we needed. Karin had no sailing experience whatsoever, but having lived in a Toyota Hilux for seven months, she believed that any sailing vessel would be more luxurious than the overland experience. I had always been interested in sailing and had read widely over the years. Now it was time to sharpen my focus, so I signed up for the Cruisers Forum and continued to read….. Sorting through the rhetoric of the adherents of catamarans and monohulls, I concluded that our choice had to be a catamaran for reasons of speed, space and stability at anchor – where cruisers spend about 85% of their time. Properly sailed, catamarans are also very seaworthy craft. Buying a boat is a most complex experience and owning a modern yacht is a bit like running a small town, someone later explained to me. You are solely responsible for your shelter, safety, whereabouts, power, food, water, locomotion and health and you need to be at your most self- reliant when crossing the three major oceans. I quickly learned that most crafts in South African waters were geared for local passages between harbours on the coast and those I looked at fell far short of the standard of sea worthiness required for a circumnavigation. For a sneak preview of what happened, watch this video clip.